You want to look your best for your wedding, and the right makeup can complement your hair and dress to give you a complete look. When planning the salon services before your wedding, it’s good to know a few basic bridal makeup tips so you know how to convey what you want to your artist. 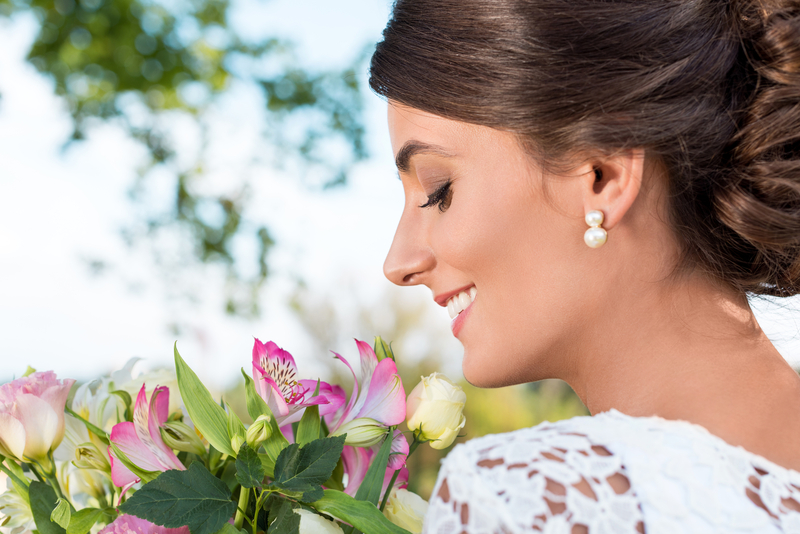 Here are a few do’s and don’t of wedding makeup. Book a trial makeup session before your big day to test out different colors and styles, which will give you time to ensure you’re happy with the look you’ll be wearing all night. Depending on how your makeup turns out, you and your makeup artist can make adjustments so you aren’t rushing when the day arrives. Instead of darker colors, try a light shadow with some shimmer in the inner corner to brighten your eyes and make them look bigger. If you have darker circles under your eyes from sleepless nights, make sure to use a peach color corrector to cancel out the darkness and concealer to lighten the area. You don’t want your look melting off halfway through your reception, so finish off your makeup with a setting spray or powder to lock it into your skin. Once your makeup artist has your look set, ask for the lipstick, powder, and other elements they used to carry with you during your wedding. This way, you can touch up your makeup when necessary to keep your appearance fresh. Foundations with SPF don’t work well with flash photography. The white light bounces off the skin when you’re wearing sun protection, making you look washed out in pictures. Go for a foundation or tinted moisturizer with no SPF instead, then have a friend take a flash photo of you to test out your look. Avoid makeup and colors you’ve never tested before your wedding, which can result in you not being happy with your look on your big day. Testing products beforehand also prevents any allergic reactions to cosmetics your skin isn’t used to. Years in the future, you’ll want to look back on your wedding day and still be happy with your makeup, so avoid trendy looks and dramatic styles that could look dated a decade from now. This might mean ditching the thick cat-eye liner and going for a timeless, fresh makeup. Forget to blend down your neck. When you begin your salon services, ask your makeup artist to apply color to your neck and shoulders, if your dress exposes them. This will ensure your face and your body match so you don’t see the line where your bare skin ends and your makeup begins. If you want to learn more about professional salon services and makeup, enroll in the Jupiter Beauty Academy in Boston, MA. Their beauty school is accredited by the American Association of Cosmetology Schools and the National Accrediting Commission of Career Arts and Sciences, preparing students for careers as hairstylists, cosmetologists, and nail artists. Visit their website to explore their available courses, or call (617) 288-1811 to learn more about their salon services.